Vector Laboratories M.O.M. Immunodetection systems are specifically designed to localize mouse primary antibodies on mouse tissue while avoiding background staining. These M.O.M. Kits contain our proprietary M.O.M. Mouse Ig Blocking Reagent. M.O.M. Kits are available based on either avidin-biotin technology (M.O.M. Elite® ABC Kit, Fluorescein Kit, or Basic Kit) or polymer technology (M.O.M. ImmPRESS® HRP Polymer Kit). Use the M.O.M. Immunodetection systems to introduce two or more different labels using a multiple antigen labeling protocol. 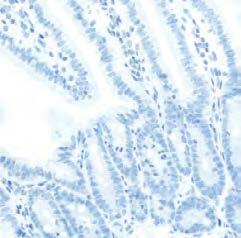 You can detect several mouse primary antibodies on the same tissue section, regardless of the species of the tissue. Excellent staining results for a once difficult application have now become routine with the Vector M.O.M. System. 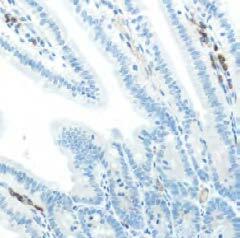 Sections of mouse kidney stained with mouse antibody against smooth muscle actin using VECTASTAIN® ABC-AP Kit and Vector® Blue substrate. Using standard biotinylated anti-mouse antibody and normal blocking serum, confusing background is seen (left). With the Vector® M.O.M. Basic Kit, clean background and specific staining is achieved (right). * This reagent must be used with the M.O.M. Mouse Ig Blocking Reagent (MKB-2213). It is not intended to be a stand-alone reagent for mouse on mouse applications.